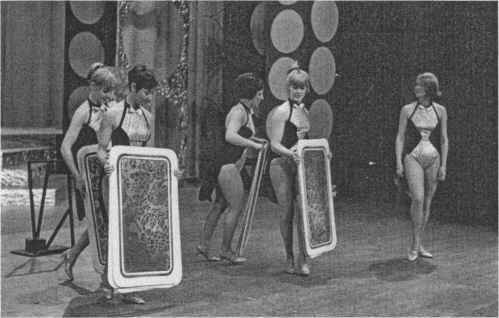 The pack performer first brings into audience contains fifty cards, two duplicate sets of txventy-five, arranged in some order. No matter where the pack is cut the same t-jenty-f ive will be dealt onto tray. Place the balance of the pack in your pocket, A napkin is spread cn the tray and folded so that its center forms a flap, which will just reach either side of tray. Under this flap lies a heap of twenty cards - (different cards from the twenty-five first used). Five cards are drawn from the twenty-five heap which lies face down on side of tray, not covered by flap. (Fig. 1). As you turn to collect cards reverse flap covering exposed cards and revealing the other twenty. Hand this second heap to someone for return of cards. Hand tray to assistant, who at the same time gives you some envelopes and pencils, which you place in outer breast pocket. Under a bundle of five envelopes, face up, is a heap of twenty-five cards - (duplicates of those from which the five were drawn) their order known by assistant. Hold the envelopes low to conceal the cards, and give out three envelopes and pencils. At this point arrive near the person who has shuffled the cards. Give him an envelope and pencil, and carelessly (?) place the cards face down on the stack of envelopes, which you turn over secretly as you apparently pass the same cards to a person across the aisle but he really gets the arranged twenty—five cards. He takes them forward and deals five rows face down. Your left hand holding envelopes drops naturally to the side, allowing cards to fall into coat pocket. You have passed out four envelopes without intimating your purpose. Pass out the fifth, then open the sixth, extracting a slip of paper from it and placing this on plain side of envelope (so person will unconsciously use envelope as a pad). Hand this to an obliging person with a hard pencil. "Will each person who has an envelope remove the slip inside" you request "Now write on it the name of some living person, except you sir. "— point to the man with the sixth envelope. "You will kindly write the name of some one not living. Let no one see it but yourself." This sixth envelope is made by cutting out the address side of another one, and sticking to it at the corners a rectangle of high grade carbon paper (carbon side down). The flap of a whole envelope is moistened, this prepared front being slipped inside flap lieing coincident and stuck together. (Fig. 2). Anything written on paper held against address side is transferred to inner front part of the envelope. When all names have been written on papers held against the envelopes — address them thus: "I want the slips folded like this—oh, yes, let me have your envelope a moment sir. No, keep the paper, so I can't learn x?hat you have written.l! Take envelope from mar who has written name of some dead person, and remove therefrom slip intentionally inserted in it before hand. "I want it folded like this," you direct, naturally placing prepared envelope on your stack, then placing entire stack under your left arm. You then illustrate how they are to fold the papers then take envelopes from under arm, but this time upside down. The prepared envelope going to the bottom of the stack. The original bottom envelope (now the top one) should be pricked at the corners with a needle so that it can be identified, no matter xvhich corner it is taken by. Give this to the person who thinks you are returning same envelope you took from him. All seal their slips in envelopes which are collected in a hat. Stepping forward you hand unused envelopes to assistant Ttfho carries them off, and returns with a handkerchief. He is blindfolded, (so he can see out from underneath bandage) and is escorted from room by committee. The assistant has employed his time well. When he carried off tray he lifted napkin flap, and learned the cards missing from the heap, by comparison with a list of the original twenty-five. When carrying off envelopes he opened fake one and learned name of dead person. You now bring out a slate and a chalk and have someone write a number of three digits and read number as you hand slate to person a few seats away. He writes a three digit number under first. Remembering total add to it third number as you pass slate to fourth person to initial it for identification. Adding up three digit numbers is extremely easy if you add hundreds first, then tens, then units. Example: Three numbers are 497 - 832 - 497 plus 800 is 1297 plus 30 is 1327 plus 2 is 1329 — plus 900 is 2229 plus 80 is 2309 plus 9 is 2318. Place slate and chalk on table, immediately bringing forv;ard tumbler containing six different colored pieces of chalk. But you ask, how are you to convey slate total to Medium? You already have done so. The communications of the next few tests depends on how and where you place the various articles on the table. Don't say disgustedly that such a proceeding would be too raw. It will if you stand absentmindedly with the articles in your hand, and figure around as to where and how you shall place it. But if you do your figuring on the way to the table, and nonchalantly lay the article down, at the same time picking up article for next text, or asking something to borrow for the next test, keeping your eyes anywhere but on your hands, it will never so much as be suspected This I vouch for. Any square or oblong table will do, a top 25 by 30 is best. At first practice with a similar diagrammed paper, just covering the table. There are 30 squares numbered in six verticle rows of five, and lettered in case you wish to convey initials. Also squares numbered 1 to 13 for the 13 playing cards and 16 to 28. Top row horizontally, represent colors, and any additional meaning can be given other squares. Practice setting things down easily and naturally on the spaces representing colors, numbers, etc. (See Fig. 3). Then remove diagram and practice the same on bare table top. The Medium's eyes can read beneath the blindfold easy as the table top is in line with his downward vision, as he stands at the blackboard. But many tests do not depend on communication at all—which makes your method that more baffling. The slate is ordinary, but one corner (on side that will be uppermost) is marked so as to be easily told. Slate is mentally divided into ten parts, numbered from 1 to 0. The total of a three digit test cannot be over 2997 so the first two can be conveyed, by some one square on table, do so by placing marked corner naturally on the necessary square. The chalk tapers but is short, third digit of answer is signaled by placing chalk on imaginary square on slate. For last digit, chalk is considered as a clock hand (small end the pointer). The imaginary dial is considered square with table, position of slate having nothing to dc with it. Figure procedure on way to table, place slate corner in proper space with left hand, and a second later lay chalk pointing on direction on right square of slate. Left hand picks up tumbler of chalk. Color is selected by setting tumbler on square for that color, apparently in a careless manner at same moment picking up pack of cards with the other hand. Pack is cut in half and a card in both halves chosen. Advance to table a half in each hand, placing them face down on proper squares, showing suits. A spectator now steps to the table and throws dice, you cover same with a cup, where they fall. A mark on cup circumference shows sum of the two dice (clock fashion). If sum is 2, 3, 1, or 12, Medium can read each dice singly— two aces, ace and deuce, five and six pair of sixes. In left trousers pocket have a stack of six half dollars, dates faces one way, their order known by Medium. Don't announce that dates are to be read. Borrow six half-dollars from as many spectators, taking them in right hand, as left hand passes arranged stack to person to carry t.o table. Right hand leaves coins in left vest pocket, bring forth a watch (not running). Watch should be of the closed face variety. Spectator sets it at any hour and shows it to you, closing it. You carry it to table. Stem indicates the hour. That is the way you face it around an imaginary clock. Number of matches are. told by placing them on the right square of the. chart on table. NOTE: Slate is placed first, being the largest article. If lying over a number later needed place the article right on slate over proper number. Be sure articles lie over right squares and you are set to call in Medium. Medium stands at blackboard where he can see down on table top, divines card, and coin. Card is forced and coin is switched. Hence these two tests are prearranged. 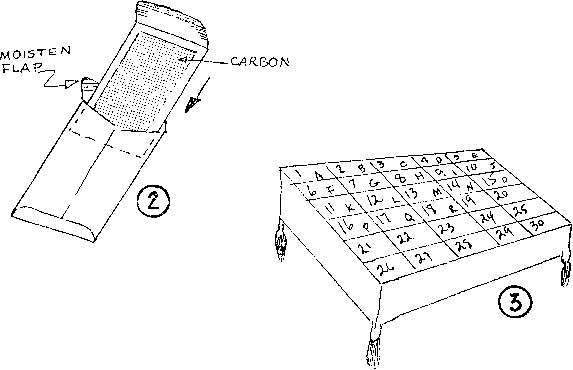 Pricked envelopes give the dead name known by prepared carbon. By glancing at this at first it will seem all jumbled up but read it over a few times and then practice it before attempting to show it. I can recommend this as a fine piece of Telepathy out once you got the knack of it. But PRACTICE, PRACTICE, PRACTICE I That means so much but is heeded s0 little.